This totally new and unique Ti hardtail, represents the pinnacle of all the experience gained from over 12 years of trail riding frame design. 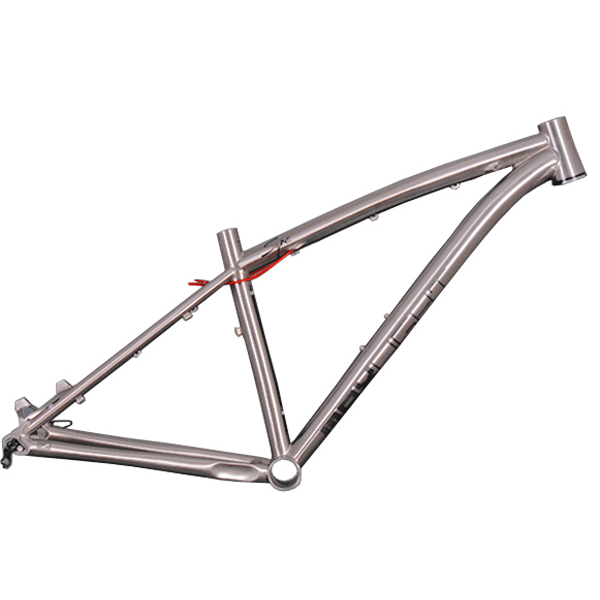 The perfect balance of this frame is reflected in it’s trail accuracy , power delivery and climbing surge. It’s designed to synchronise perfectly with the rider and for this reason the small size is designed around 650b (27.5”) wheels, whilst Medium/Large use 29”. Every tube size and section and every angle has been carefully considered, ride tested and revised where necessary. You will not find another frame like this on the planet! The Sync is designed for trail riding and singletrack with an aggressive edge, it works best with a 120mm travel fork. • Machined taper 1.5” Head tube. • Top tube, Internal gear-cable routing. • 142 x 12 DT Swiss Thru-axle. • Investment cast dropouts and post disc-mount. • ‘QuadRad’ section top tube resists forces at highly stressed seat tube area.